Radiant barrier foil helps keep the heat IN for climates that have long cold seasons. The foil prevents radiant heat loss by blocking 97% of the heat from escaping through the foil. BUY SuperPerf™ radiant barrier here! SuperPerf™ radiant barrier foil is punched to create perforations, versus our traditionally perforated foil that’s perforated with pin-holes. These larger holes allow for moisture to have a much easier path to escape past the foil layer. In cold climates, the preferred installation method is laying radiant barrier foil over the insulation on the attic floor to keep heat in during the cold months and to help block heat in hotter months. This type of installation is easier than the conventional staple-up method, but it also has some precautions. The most important tip when installing a radiant barrier over your insulation in the attic is to make sure you don’t block any areas that are bringing air/moisture from inside the home into the attic, or areas that are producing a lot of heat. The two main examples of this are bathroom vents and can (or recessed) lights. 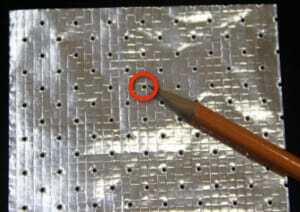 In the event that a bathroom vent or can light was mistakenly covered with a regular perforated foil, the moisture produced in these areas may not easily pass through a tiny pin hole. However, with the new SuperPerf™ foil, most all of your moisture concerns are cast aside because this foil is very breathable! As if the peace-of-mind wasn’t enough, you also need no special tools or processes to install this foil! The product goes over your existing attic insulation, just as shown on our Over Insulation Method page. The foil can easily be trimmed to fit the space you have and then simply lay it out over your insulation, making sure to avoid bathroom fans and can lights as usual. Pieces should overlap a couple of inches at most and don’t worry if you can’t reach a few areas. You can either use a long pole with a nail taped to the end, or you can skip an area if it’s too hard to reach. 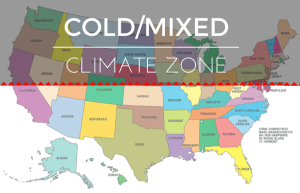 Live in a HOT/mixed climate (hot summers and cold winters)? If you have NO ductwork in your attic and your attic floor is free and clear of HVAC components and miscellaneous storage boxes, then you can use the SuperPerf™ or the Original AtticFoil™ for an over-insulation method. For homes like this, using radiant barrier foil on top of the insulation gives you the best year round benefit by both reflecting heat in the summer and keeping heat inside the home in the winter. If your attic does have ductwork or storage and you’re looking for year round benefits, you should consider a hybrid method installation. If you have any questions about this product or any of our other styles of radiant barrier foil – contact us! We will gladly talk to you about any project you’re considering and help you decide what insulation is right for your situation.